The President looks at two public law initiatives. 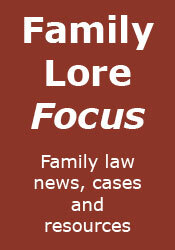 Full article: Family Law. A project funded by the Nuffield Foundation and supported by the Association of Lawyers for Children aims to develop draft guidance to assist judges in the anonymisation of children judgments in public law proceedings. Full story: Family Law. A north-west firm is considering appealing a Court of Protection ruling in which it was removed as a financial deputy in a case concerning deprivation of liberty and care arrangements. Full story: Law Society Gazette. See Mrs P v Rochdale Borough Council & Anor. Changes to legislation may be required in order to curb steep rises in the number of applications for children to be taken into care, the chief executive of the Children and Family Court Advisory and Support Service (Cafcass) has said. Full story: Children & Young People Now. Appeal by child against the making of a secure accommodation order. Appeal dismissed. Full report: Bailii. Judgment considering various applications made by nephew of elderly lady lacking capacity. Full report: Bailii. Judgment dealing with numerous matters raised by nephew of patient, in relation to earlier judgment. Full report: Bailii.